Track and audit any energy or non-energy commodity and any type of bill detail. Whether you enter data manually using bill entry templates, import your data, or subscribe to our Bill CAPture service, EnergyCAP tracks the information you want in the format you need. EnergyCAP provides two different hierarchical views—Buildings & Meters and Accounts—so you can view and report both data types separately. Leveraging the power of a relational database, hyperlinks make it easy to jump between accounts, buildings, and meters. By helping you correlate cost and consumption information, EnergyCAP provides granular and summary-level data from both perspectives for powerful analytics that yield actionable insights. In addition, a sophisticated memo and message system links action items and information to specific accounts and locations, making it easy to resolve utility billing and energy management issues. 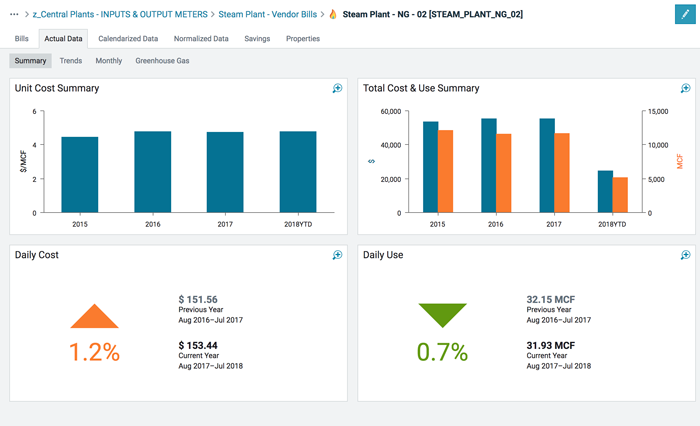 EnergyCAP’s dashboards, PowerViews, and reports provide a clear picture of each account’s and meter’s cost and consumption history for months or years, and in graphical and tabular formats.